Let’s face it—the latest trend of sleek-lined crossovers is here to stay, and we can look forward to more and more manufacturers creating new vehicles based on this larger design ethos. (See what you’ve done, BMW X6?) So Honda, known for game-changing products, was certain to remind us that the brand new Accord Crosstour had been in the works for many years. “We had been planning this one since before anyone even saw the X6,” we were assured by one executive. When we asked if the Crosstour was in any way developed alongside the recently released Acura ZDX, we were told that the two vehicles have nothing in common with one another. In fact, Honda pointed out that while the ZDX was designed and engineered in America, the Crosstour is, for the most part, the fruit of Japanese labor. But is it unique? Aside from the styling, there isn’t a whole lot of newness to this car. As the vehicle’s name suggests, the Crosstour is based on the trusty Accord sedan, and instead of dropping the Accord name, Honda left it in place to build better familiarity within its consumer base. Truth be told, about 60 percent of the Crosstour is made up of standard Accord parts, and Honda won’t shy away from telling anyone and everyone that the Crosstour is an extension of the Accord lineup. The automaker wants consumers to view this vehicle as a more premium version of the Accord, but one that offers the space and functionality of a crossover. While this all makes a whole lot of sense in concept, the final product is a bit of an odd duck. What Honda has created here is a vehicle that is relatively good to drive and has a lot of sedan-like road-going characteristics, but doesn’t make a whole lot of sense as a crossover. The Crosstour’s good-to-drive-ness does give it an edge over more un-involving vehicles like the Venza or Murano, though it’s a little hard to see how it might capture customers from those stalwarts, to say nothing of its own brothers. As a crossover, this vehicle has an odd fit into Honda’s product line. 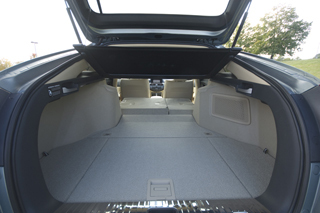 To wit, the CR-V is only four-tenths of an inch taller than the Crosstour and it rides on a much shorter wheelbase, and yet it boasts 21.6 more cubic feet of storage space behind the front seats. 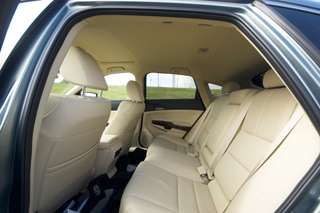 What’s more, the CR-V offers more headroom and legroom for front passengers, and more legroom in the second row. And price? A fully loaded CR-V with all-wheel drive is only about $1000 more than a base, front-drive Crosstour. Doesn’t make a whole lot of sense to us. That said, a majorly redeeming quality of the Crosstour is how good it is to drive. The only powertrain available is the Accord-sourced 3.5-liter V-6, which produces 271 horsepower and 254 pound-feet of torque, mated to a five-speed automatic transmission. Curiously, no four-cylinder engine is available, though engineers explained that putting a four-pot mill in the Crosstour only netted one extra mile per gallon, so they opted to only offer a V-6. Still, a four-cylinder version could have lowered the car’s starting MSRP. Front-wheel drive is standard and all-wheel drive is optional, but Honda only expects a small margin of all Crosstour sales to have power routed to all four wheels. (Don’t expect to see all-wheel drive making its way into the Accord sedan anytime soon, either.) Our front-drive test car felt peppy while being tossed along back roads, but was subject to a bit of body roll and understeer in the corners. We mostly attribute this to the skinny eighteen-inch rubber that higher-level Crosstours are equipped with; the Toyota Venza and Ford Flex are much more competent through the bends, mostly due to their wider tracks and beefier tires. The Crosstour does, however, benefit from cornering shift control, which holds the selected gear through a turn to eliminate the transmission’s tendency to change gears. This allows for a much more linear acceleration feel upon exiting a turn without needing to downshift to a lower gear to achieve max power. It’s smooth, too—something that we can appreciate in a vehicle that isn’t meant to be a nimble sports car. Since most of the Crosstour’s underpinnings are Accord stock, we weren’t surprised to experience crisp turning and lots of driver feedback through the steering wheel. Larger brakes have been fitted at all four corners to account for the added weight of the crossover versus the sedan, and they are appreciated. Sure, the Crosstour is a far more engaging drive than the Venza, but it doesn’t feel as sure-footed and solid on the road. 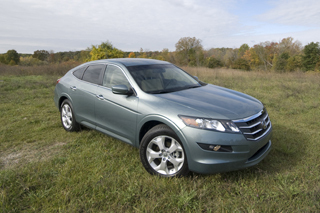 We spent a long portion of our drive loop on the highway, too, and found the Crosstour to be smooth and comfortable. The ride is relatively firm, yet suspension damping is good, and the car is hardly fazed by potholes and pavement breaks. 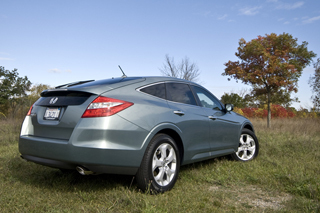 Honda’s cylinder deactivation system is also on hand with the Crosstour, allowing it to run as a three- or four-cylinder engine at times, drastically improving fuel economy. Our front-drive tester is said to achieve up to 27 miles per gallon on the highway (18 in the city), which really isn’t too bad. A big problem here is that consumers buying up into the mid-$30K crossover segment expect certain amenities that the Crosstour simply doesn’t offer. Want premium features like cooled seats, heated steering wheel, streaming Bluetooth audio, manu-matic shifting, power liftgate, panoramic moonroof, rear-seat entertainment, or HID headlamps? Don’t look at the Crosstour. Though the interior fit and finish is well-done overall, it doesn’t feel as plush or comfortable as a Venza—nor does it have the Toyota’s extensive options list. In the new world of crossovers, dynamic exterior styling is one of the strongest selling points for new consumers looking to step down from boxy SUVs or up from milquetoast mid-size sedans. We have a hard time seeing Crosstour passing muster here. This isn’t an attractive car from any angle. We feel odd saying it, but the car makes eighteen-inch wheels look extremely small because of its overly large features (headlamps, grille, etc.). Pricing for the Accord Crosstour starts at $29,670 for the base, front-drive model, and goes up as high as $36,220 if you want all-wheel drive and navigation. It’s not as engaging to drive as the Accord sedan, yet it does fulfill the crossover requirements of having more usable storage space and a slightly higher ride height, which is a huge selling point for a lot of consumers. 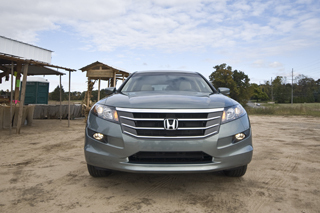 If you need a bit more brute than a four-door sedan and you can get past the looks, the Crosstour is a good option, but so is a Honda CR-V (for less money and more functionality). Want all of those features plus some truly premium equipment? The Acura TSX Sport Wagon will be hitting dealers next Fall. So while the Crosstour is relatively good to drive and may do the job of a crossover rather well, it just doesn’t make sense as a Honda. The automaker will now find this vehicle competing head-on against its CR-V, Pilot, and Accord, and because its only unique aspect—the styling—isn’t a huge success, we can’t see it exactly flying off of dealer lots. If consumers judge this book by its cover, the Crosstour won’t be terribly appealing. Too bad really, as it’s a CUV that would be a better-than-most choice for enthusiast drivers. We can only hope that the Crosstour’s strong road manners are enough to win over the consumer set.